Black + Decker ™ are a United States based company that provides power tools and accessories for all sorts of clientele. This versatile company has a long and prestigious history of providing customers with the best tools and appliances for over a century, ever since its inception in 1910. Today, Black + Decker™ offers power tools for the motor industry as well which allows millions of car owners to take care of their car properly. We offer you the chance to buy the best quality Black + Decker ™ car tools online at EAUTO.pk. Cleaning your car may not always be the easiest of tasks, or the most enjoyable. It requires getting into nooks and crannies you didn’t even know existed in the car and even when you reach them, getting the dirt and debris out is another task altogether. That is why Black + Decker ™ products have been so successful in making a name for themselves among the car enthusiasts. These car power tools allow you to minimize effort and maximize results while cleaning your car. You don’t have to remove stains with good old elbow grease when you have the Black + Decker ™ Pressure Washer that ejects a powerful spray of water and allows you to eliminate hard to remove stains in a matter of seconds. Or consider the Black + Decker ™ car handheld vacuum that makes those unreachable corners of the car, an ease to clean. Black + Decker ™ also offer polishers that make spreading that car body polish easy and fun, not to mention time saving. These power tools and appliances have become a big part of the motoring industry since they allow painstaking car care tasks to be completed in a matter of minutes efficiently and effectively. 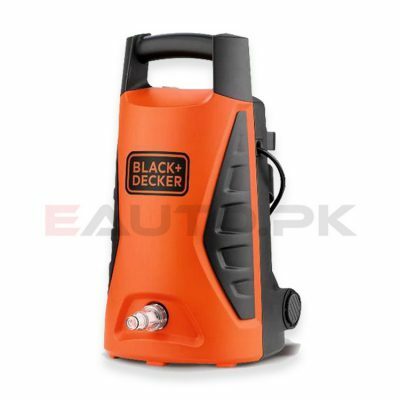 Black + Decker ™ products are a must have for any modern car enthusiast and you can purchase them at EAUTO, where you can find the highest quality Black + Decker ™ car tools the most affordable prices in Pakistan. Just use our “Search by Brand” option to find your desired product and order it, and we shall deliver it to your doorstep.